via: http://www.tcm.com/tcmdb/title/221/I-Love-You-Again/#tcmarcp-151645 Unless otherwise noted, all images are my own. 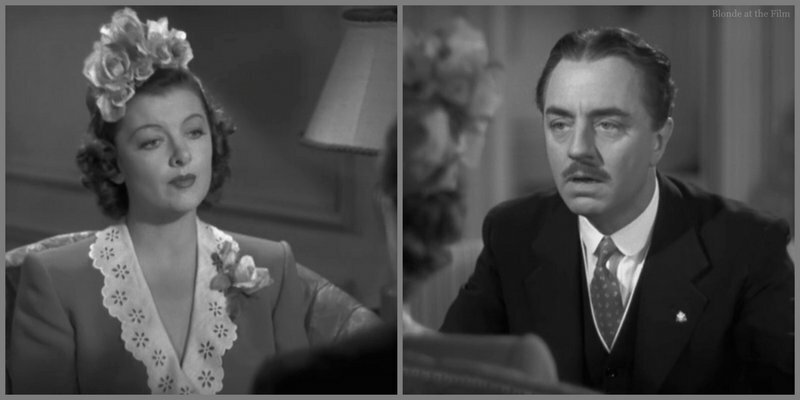 William Powell and Myrna Loy are back, though not as Nick and Nora Charles. 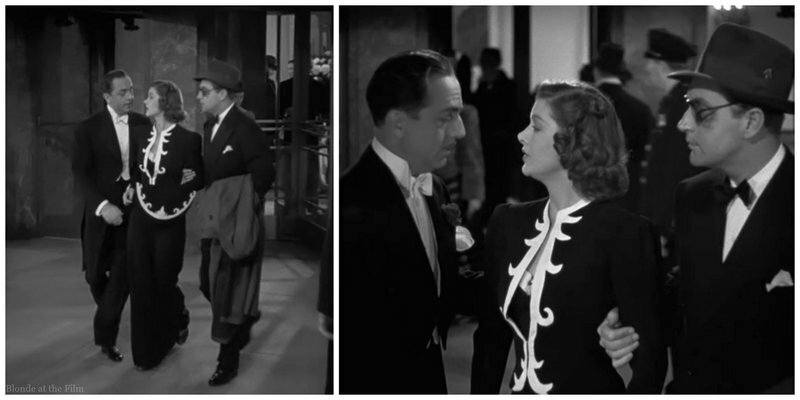 Although this charming duo is most famous for The Thin Man series, the pair made fourteen movies together, and only six of those were Thin Man films. The project also reunited Loy and Powell with another frequent collaborator, director W.S. Van Dyke. Van Dyke directed them in six films, including four Thin Mans. So although this movie ended up as a reunion of sorts between Van Dyke, Loy, and Powell, the seemingly pre-ordained casting almost didn’t happen. So Loy was reassigned to I Love You Again, a movie that makes no mention of the World War already in progress across the Atlantic. 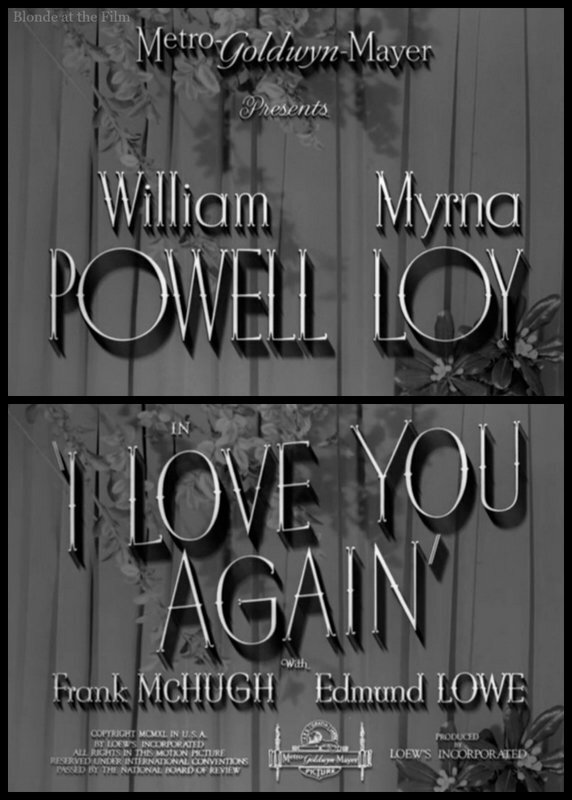 Fun fact: this film was based on the 1937 novel “I Love You Again” by Octavus Roy Cohen, an extremely prolific writer. Cohen is perhaps best known for his Jim Hanvey detective stories and novels. We open on a cruise ship where two men discuss an annoying fellow passenger named Larry Wilson who has bored them silly with his conversation and teetotaling ways. Then this dull stick in the mud appears, and it’s William Powell! It’s a fun twist on audience expectations–Powell usually plays such charming and debonair characters! And definitely not teetotalers. But Larry Wilson is a real drip. He looks as though he just stepped out of the Victorian era, and that about sums up his moral sensibility, too. Larry asks the men to join him for a drink, specifies that they will be going Dutch, naturally, and then orders ginger ale and grape juice. 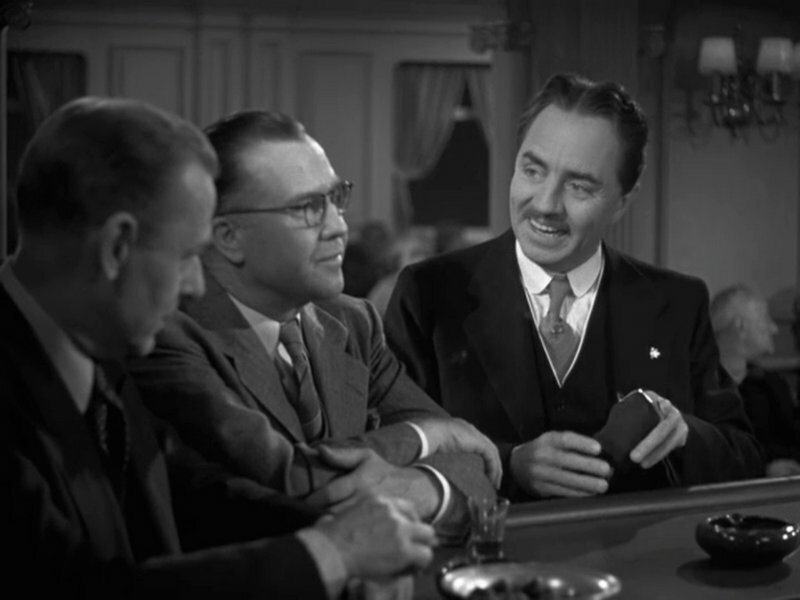 When sloppily drunk Doc Ryan (Frank McHugh) stumbles into the bar, Larry excuses himself with a look of pure disdain at Doc’s uncouth behavior. But rather than take the hint, Doc follows Larry out onto the deck where he makes the very poor decision to demonstrate his skill at walking on the railing. Doc falls overboard almost at once, of course. When Larry throws him a buoy, the rope gets tangled around Larry’s ankle and sends him falling into the ocean, too. The sailors lower a lifeboat and rescue the two men, but not before accidentally clocking Larry on the head with an oar. More troubling than that, though, is his insistence that his name is George Carey, not Larry Wilson, and that the year is 1931, not the actual date of 1940. Larry/George thinks he is on a train nine years ago, and has no memory of anything after he was hit on the head aboard said train back in 1931. Eventually we understand that after George Carey was hit on the head in 1931, he woke up convinced that he was a sensible, respectable, dull teetotaler named Larry Wilson. The recent oar to the head joggled his brains and returned him to his original identity of George Carey, con man. He has no memory of the last nine years of his life as Larry. George and Doc go through “Larry’s” luggage to try to discover who this guy is. It’s a fun twist on the typical search scene, because George and Doc are snooping through George’s own things, and there is no danger of “Larry” walking in and discovering the violation! Larry’s wallet is bursting with membership cards to every respectable club, charity, and organization in his hometown of Habersville, PA. It’s all very dull and proper until they they find Larry’s bank book. They are thrilled to discover an account bursting with $147,000! They decide to go to Habersville, clean out the bank accounts, and skip town. It’s a foolproof plan, and actually legal, since George is Larry. But they hit a snag, as all foolproof movie plans must. The ship docks in New York, and a lovely woman is waiting to greet “Larry.” “Some dish,” George says, leering, before realizing that she is waving at him! 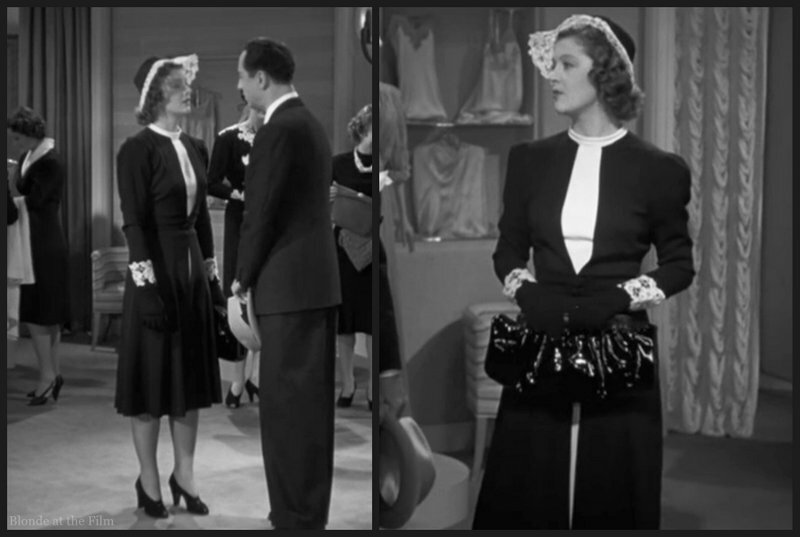 Larry and Doc greet this strange woman (Myrna Loy) cordially but suspiciously, as they have no idea who she is. She’s taken aback by this coolness, as she happens to be Larry’s wife! She mentions that fact when she introduces herself to Doc. They are pretty surprised; remember, George had no memory at all of the last nine years as “Larry.” But it’s not an altogether unpleasant shock. In fact, Larry is pretty taken with her already. Larry is feeling pretty good about his plan. In a few days he’ll be a great deal richer, and in the meantime he gets to enjoy the wifely attentions of this beautiful woman without any of the troublesome courting/formalities! The trio heads to a hotel where Larry hopes to enjoy some quality time with his wife. Doc is against it, rightly reminding Larry that he doesn’t even know his wife’s name, but that gets solved rather cleverly when Larry shouts “Okay, okay!” to a retreating Doc. His wife responds with, “Yes?” Aha! Her name is Kay! Larry and Kay sit down for a chat, and Kay reminds a clueless Larry that she wants a divorce. They’ve been basically separated for months and she wants out. She’s tired of Larry’s dull, sanctimonious lifestyle, and of feeling far less important than the Rotary Club or the Junior Rangers. Indeed, she’s already engaged to someone else, and they’re just waiting for stubborn, old-fashioned Larry to grant her the divorce. Looks like Larry won’t be enjoying those wifely attentions after all! Kay has even arranged for a separate hotel room, and she has been accompanied to New York by her fiancé, Herbert (Donald Douglas.) Larry is disappointed, and a little mad that stupid Old Larry could have lost such a woman. He takes out some of his frustration on Herbert, and their meeting ends in fisticuffs. The bad news keeps coming for Larry. He had requested $5,000 from his bank as a test withdrawal, and the banker comes all the way to New York to personally deliver the sum. He also gives Larry a deed to some property that he finally paid off. Larry and Doc are riding high until the banker announces that Larry is now $27 overdrawn on his account, and that the $147,000 account is the “Community Chest Fund;” although Larry is one of the trustees, he has no access to the money! The big scheme has fallen flat, but rather than give up and cut out, George decides to keep playing “Larry,” especially where Kay is concerned. He and Doc want to see if there is anything else they can milk out of George’s alter ego. They immediately hit upon a con in which they plant oil and trick wealthy investors into buying Larry’s “oil-rich” land for many times its worth. So they call upon one of Larry’s old grifter buddies, Duke (Edmund Lowe), who specializes in this kind of con. He makes his way to Habersville. Meanwhile, Larry stays focused on Kay. 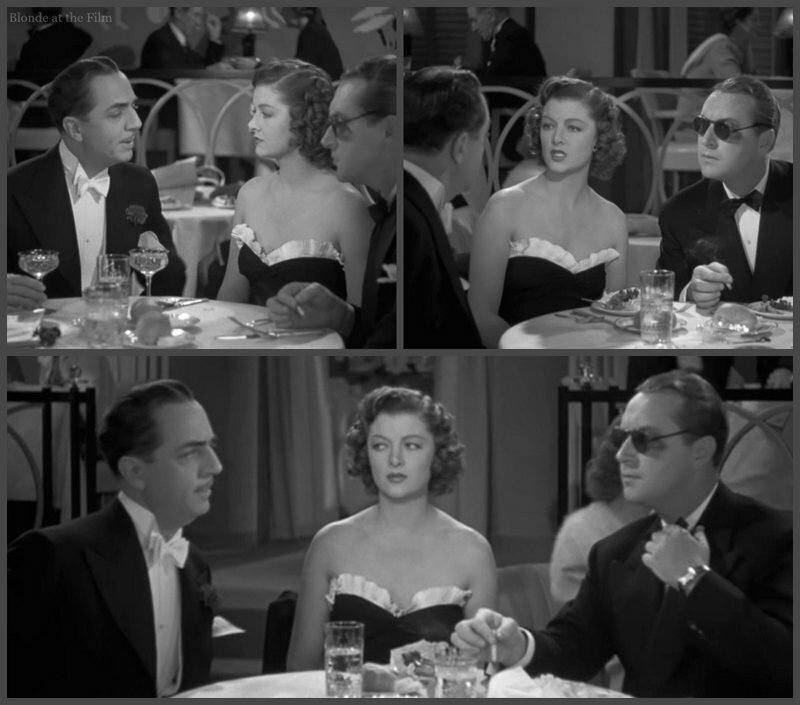 He invites Herbert (hiding his black eye behind sunglasses) and Kay to a fancy restaurant, which shocks his wife. She is used to a penny-pinching, teetotaling Larry, not this suave fellow who guzzles champagne! Larry even ups his sartorial game and shaves off part of his dorky mustache. Even more shocking than the champagne is Larry’s dance fever and newfound skill. We learn that Old Larry was a terrible dancer who loved a good ol’ Virginia Reel but couldn’t keep up with a waltz. Unsurprisingly, when he asks Kay to dance, she flatly refuses. So Larry jumps up and begins dancing with himself to the delighted confusion of everyone around. 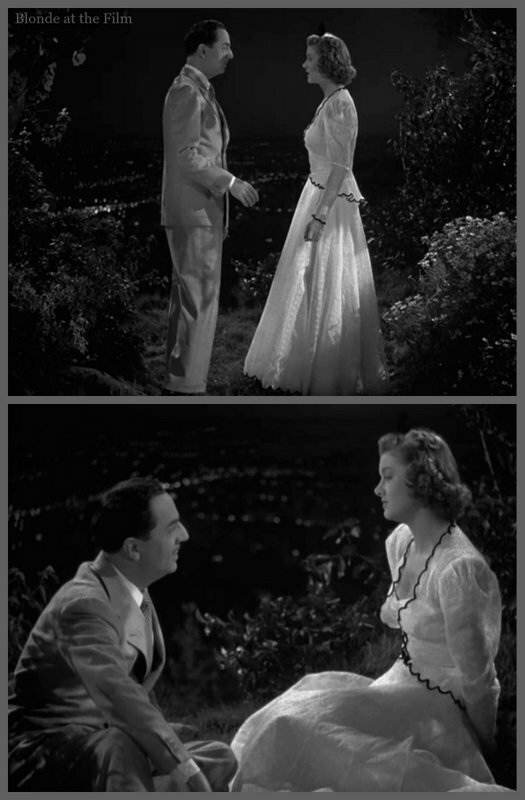 It’s a very funny scene as Larry steps lively and twirls his imaginary partner. But Kay doesn’t think it’s that amusing. When her embarrassment reaches critical levels, Kay finally steps in. One point for Larry! Kay is amazed at how graceful and skilled Larry has become, and he enjoys holding her close. But the dance is as far as things go. As soon as the music stops, Kay returns to her seat and they talk divorce. Larry refuses to grant it unless Kay keeps up the appearances of being his wife for the next six weeks. Kay and Herbert immediately assume that Larry wants to avoid any scandal before the upcoming election of the President of the Chamber of Commerce. It’s just like Larry to put something like that ahead of his wife! But actually Larry asks for six weeks of marriage to give him time to romance Kay. Kay begrudgingly agrees to the six-week term, puts on her scrolled jacket, grabs her enormous fan-shaped purse, and off they go! The next day, the whole gang arrives in Habersville, Pennsylvania where Larry is given a hero’s welcome with a parade and a banner and a band! Side note: Notice how different Larry looks now than he did in the beginning of the movie. One of the first people to greet Larry is Kay’s mother (Nella Walker). She hugs him and calls him “Darling,” and Larry whispers “Ixnay, ixnay, the wife!” as he struggles out of her embrace because he assumes she is one of his paramours, not his mother-in-law! This movie is full of amnesia jokes like that one. Anyway, Larry gets a key to the city and a new trumpet. Larry could play, but George can’t…his well-publicized injury comes in handy when he “faints” dead away when asked to serenade the town with the trumpet. Doc masquerades as an actual doctor in charge of Larry’s recovery, which also comes in handy. For example, he proclaims that such fainting spells will problem happen randomly for the next several weeks, which gives Larry a convenient “out” whenever he’s confronted with a tricky situation. Doc and Kay get an “unconscious” Larry home and settle him in his room. He needs rest and quiet, says Doc, as he shoos Kay and Mother out of the room. Larry recovers from his “faint” as soon as he and Doc are alone. They have plotting to do! But first, Larry is surprised to see so many dead, stuffed animals staring back at him. 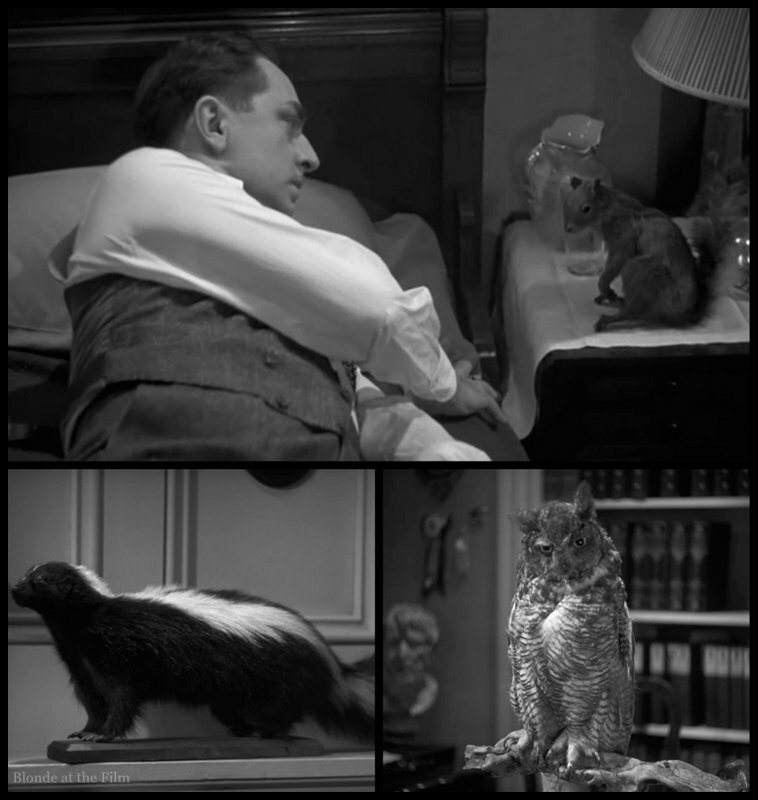 Apparently old Larry was very into taxidermy. The squirrel perched on the bedside table is a particular favorite. Besides the rest and quiet, Doc also recommends frequent and generous helpings of alcohol. (He’s a real pal!) Everyone is surprised by the suggested treatment, but Doc insists that the best thing for Larry is liquor, and plenty of it! Mother is shocked, and also concerned that her teetotaling son-in-law simply won’t be able to drink the champagne, scotch, and bourbon that Doc has ordered. One of my favorite scenes comes when Larry expertly mixes a drink using ice cubes from his cold pack, and takes a long, satisfied pull. When Mother pokes her head in his room to check on him, he immediately makes a face as though the taste is highly unpleasant to him. Mother then comes into the room and makes sure he finishes his “medicine!” It’s very funny to see Nick Charles/William Powell pretending to hate the taste of a cocktail! After downing his drink, Larry goes to Kay’s room (they’ve been sleeping in separate bedrooms for quite a while) and whines that he is hungry. Kay tells him to go fix something himself, but Mother hears the exchange and shames Kay into helping her “injured” husband. Kay sets a marvelous late-night table, doesn’t she? I’m afraid my dinner parties can’t even compare to her impromptu midnight meals. And her shiny quilted robe is very glamorous. Costume appreciation break. 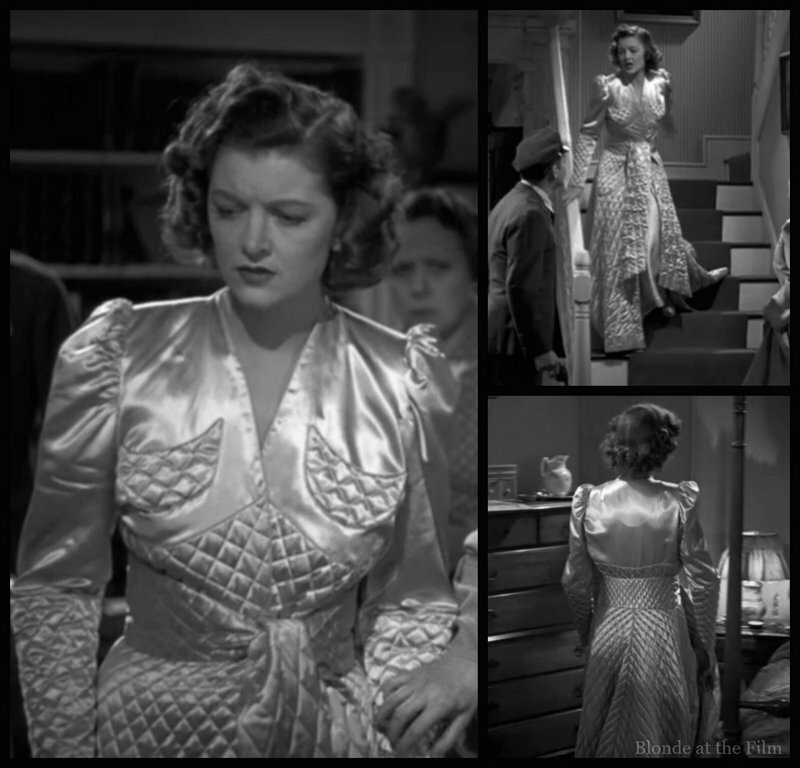 Dolly Tree, who also designed Loy’s costumes in The Thin Man and After The Thin Man, crafted the looks for this film. Larry thinks that he is making some headway winning his wife back, but he’s quite wrong. Kay makes sure he knows where he stands with a terrific closing line. 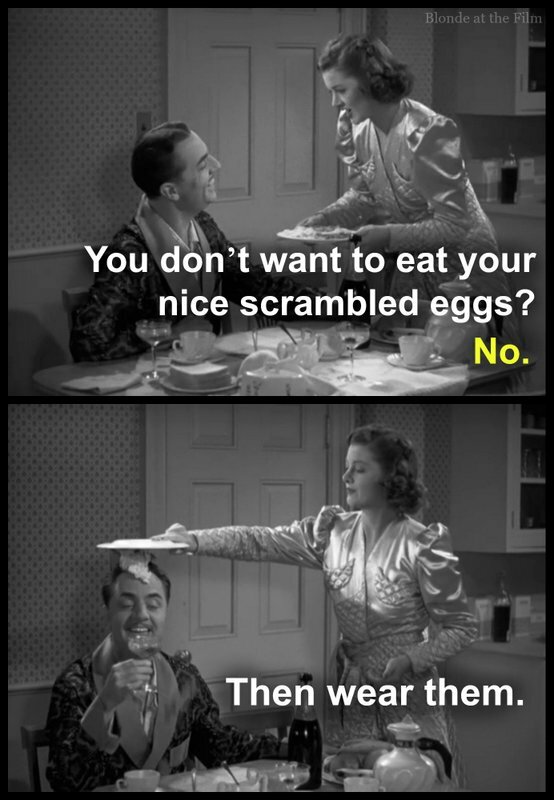 Fun fact: this whole late night scrambled eggs situation can be found in After The Thin Man, too, though that time it is Myrna Loy’s character who gets hungry. And the eggs don’t get eaten because Asta steals a vital clue and Nick and Nora have to chase him around the house. 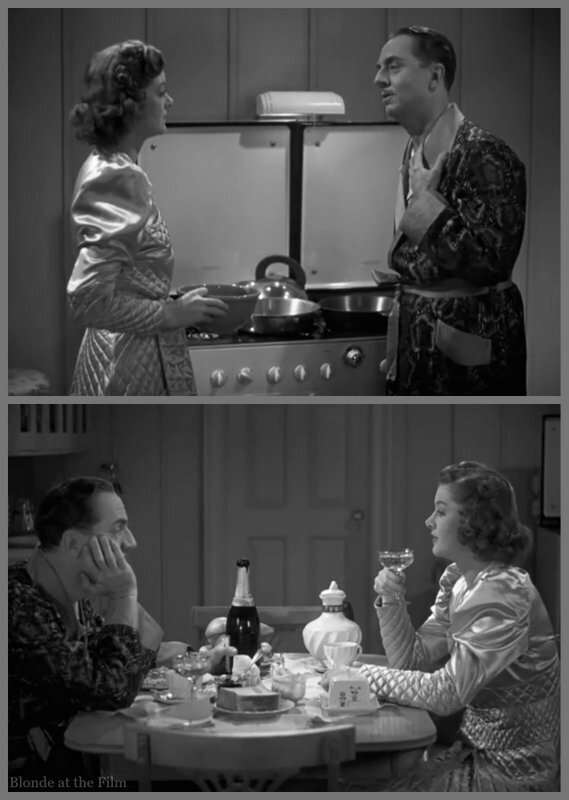 But for some reason it’s fun to see Loy and Powell fixing supper in their robes. Anyway, after failing to impress his wife, Larry refocuses on his scam. He and Doc visit Larry’s office so that Larry can familiarize himself with the place before work in the morning. Larry is the manager of the Habersville Pottery factory. Their midnight tour ends when he and Doc accidentally set off the alarm and knock over an entire store room of inventory. Policeman chase them all the way back to Larry’s house, though they think they are chasing intruders, not Larry. Doc and Larry climb into his room and jump into his bed, fully clothed, just as the police arrive to search the house. Doc and Larry are almost caught when Mother gets concerned about Larry’s panting and his sweating face (he is not in great shape, apparently.) She tries to feel Larry’s feet to see if he is cold, but he is still wearing his shoes and socks, so Doc quickly slips off his shoes and pretends his feet are Larry’s. Also, it appears that Mother used some leftover quilted satin from Kay’s robe to spruce up her lapels, doesn’t it? The next day, Larry goes to work and cleverly manages to avoid any slip-ups that might reveal his memory loss and alter ego. This movie is fun to watch for some of these more quotidian moments when Larry has to think fast and explain why he can’t remember where he keeps his account book or how to answer his intercom system. Between all the subterfuge and “Oh, yes, how silly of me!” excuses, Larry finds time to have a quick meeting with Duke, the oil-planting con-man, and to take Kay shopping. She’s confused by this, as usually she has to beg Larry for her miserly allowance to complete even the necessary household shopping. 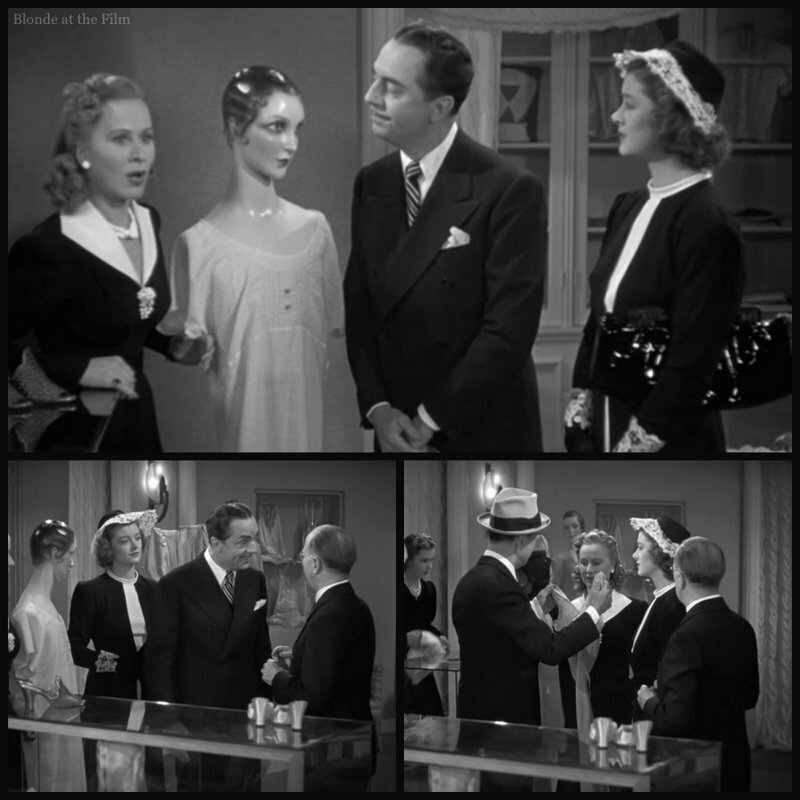 Her confusion only deepens when Larry demands to purchase an expensive nightgown for Kay instead of his usual call to “Bring me the cheapest you have.” It’s such a change from Old Larry that the saleswoman has trouble believing him and calls for the manager to help her out. It’s a really fun scene for us, but very bewildering for Kay. Who is this new Larry who drops ninety dollars on a nightgown? Costume appreciation break. Myrna Loy always looks so smart and stylish in a believable way, even with a doily hat. Kay is starting to believe that Larry really has changed, which is causing a great deal of internal conflict. She was so sure she wanted a divorce, but suddenly Larry isn’t so terrible. He’s actually fun to be with now! That night, Larry and Doc meet with Duke by a pond on Larry’s land. Duke has planted the oil, so now all Larry and Doc have to do is get townspeople out to the deserted spot to find it. And they’d better do it soon, warns Duke. He intends to make a lot of money from this deal, and he’s a very tough customer. Much more intense than Doc or Larry who seem like sweet, kind con men. But back to the love story. That’s why we’re watching, after all! Larry visits Kay that night as she tries on one of her new gowns. Stunning, right? Kay tells him that she’s confused and she doesn’t want him to try to win her back anymore. She had fallen out of love with Old Larry, but she’s feeling love-like twinges for him now. Having a crush on your husband when you’ve decided to divorce him and you’re already engaged to somebody else is very inconvenient! In an adorable twist, Larry listens to Kay and then just coos like a lovebird in response. He thinks it is all part of the flirtatious game he’s playing, but then she starts to cry and he feels rather badly. Costume appreciation break. 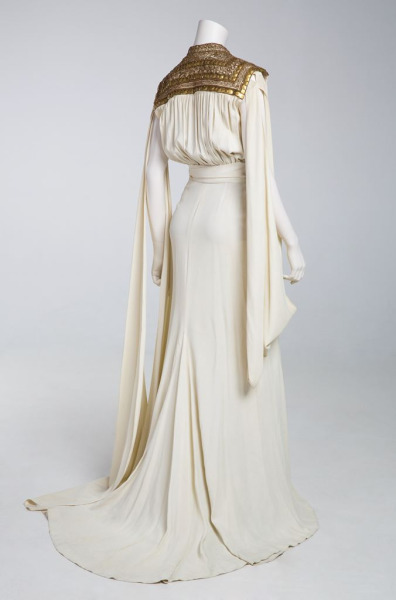 The white and gold gorgeousness from this scene is part of the “Costumes from the Golden Age of Hollywood” exhibit at the Museum of Brisbane in Australia. The next day, Larry is faking his way through work when the Junior Rangers, a Boy Scout-esque organization, show up for their weekly meeting. Old Larry was an accomplished troupe leader, but New Larry is not very outdoorsy. There is a cute moment when Larry in his comical uniform leads his troupe down the street past Duke. Duke is so shocked to see his con-man pal that he trips over a fire hydrant in front of a movie theater. A poster for Northwest Passage is displayed behind him. Fun fact: Northwest Passage was an MGM film starring Spencer Tracy that opened in February, 1940. I Love You Again opened in August that same year, but Northwest Passage would still have been slowly working its way across the country, so the poster is a tidy bit of product placement for MGM. Larry has an even more embarrassing encounter in store. The Rangers pass a golf course on their way to the woods, and of course Kay and Herbert are positioned right by the path. Larry tries to sneak by but Herbert sees him. 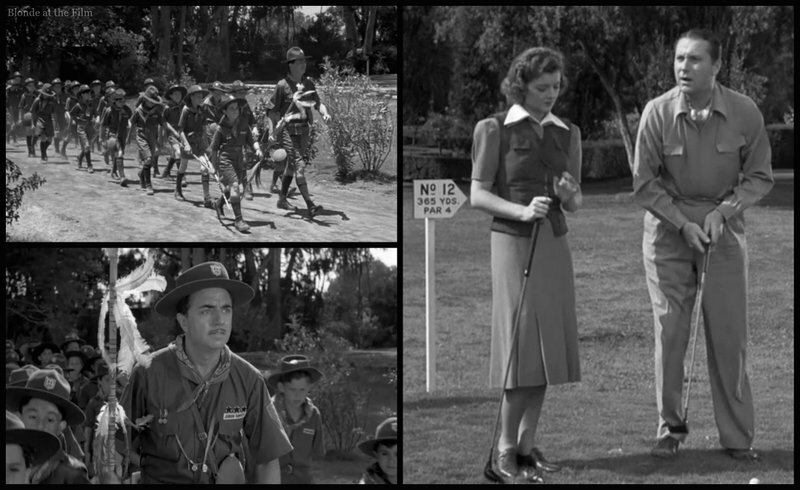 The joke is that it is humiliating for Larry to be seen by Kay and Herbert in his silly Ranger outfit leading the group of boys. But Old Larry did this all the time and was highly invested in his troupe, so Kay obviously knew about it before this moment! She’s probably seen him with the troupe dozens and dozens of times, so I’m not sure why Herbert and Kay should be so surprised to see him now. This encounter is funny but doesn’t make a whole lot of sense within the plot. Anyway, today happens to be one of the Junior Ranger’s tracking tests. Larry is supposed to slide metal deer-hoof-shaped cleats on his shoes and run off into the woods. If the Ranger can find him within a certain amount of time, he earns his badge. Larry is clueless about all of this, of course. To make matters worse, another troupe leader is visiting in order to watch Larry perform his tracking maneuver. Larry is apparently revered for his skills within the Junior Ranger organization. Fun fact: the Ranger taking the test is Carl “Alfalfa” Switzer, who played Alfalfa in the 1930s series Our Gang, also known as The Little Rascals. You may also recognize him from a brief moment in White Christmas when Vera-Ellen passes Bing Crosby a picture of her “brother.” It’s grown-up Alfalfa! Disconcerted Larry runs off into the woods trailed by the visiting troupe leader. It’s a movie rule that whenever someone uncomfortable with Nature is let loose in a forest/jungle, he or she has to fall in a pit. So Larry does. The troupe leader thinks it is a clever ruse to evade Alfalfa, and Larry lets that impression stand. It was funny to see William Powell refuse liquor, and it’s also amusing to see him disheveled and dirty at the bottom of a pit. He’s playing with his swanky, sophisticated image in this film, and it works. Anyway, Larry gets out of the pit but then gets caught in a bear trap (another movie rule), but somehow manages to lead the troupe to the pond where Duke planted the oil. The troupe notices the black slick on the surface at once. Several of the boys have very wealthy, influential fathers, so Larry is confident that his trick has worked. Three of the fathers bring their sons back to the pond that night to see for themselves in secret. Then they rush to Larry’s house to make him an offer for the land. They don’t mention the oil, of course, and Larry plays dumb and is about to sign the papers when Duke arrives for the second part of the con. He offers an exponentially larger sum for the land, which the other men match. Larry and Duke’s plan is going perfectly! Then Kay comes in because she has heard about the oil and is concerned that Larry is being taken advantage of. Her arrival only helps ratchet up the price. Larry says he needs to think it over, so he and Kay go for a romantic stroll. But first, she slips a break-up letter to Herbert into the mailbox. She’s done with him, and ready to try again with Larry. Kay and Larry end up at a lovely overlook where Larry first proposed to her. He asks her why she ever married him in the first place, and she says that she knew he was dull and proper on the surface, but she thought she sensed an exciting, charming man underneath. But over the years that elusive side of Larry seemed to drift away until finally Kay gave up and asked for a divorce. Then Larry got back from the cruise, and everything was different! He was the man she’d always hoped he would become. Fun fact: as I mentioned earlier, this was Loy and Powell’s ninth movie together, and they were good friends. Powell liked to prank his lovely co-star, and he planned something special on her birthday when they were filming this movie. He started messing up his lines (the director and crew were in on the prank) and asked Loy to rehearse with him for a few minutes in a corner of the soundstage so he could re-group. They started running lines near an enormous canvas flat (a wooden frame covered in material that could be used as a backdrop). Suddenly, the flat began to shake wildly, and it looked as though it was going to fall on the two stars. To ratchet up the drama, the lights went out. Loy was screaming, certain she was about to be crushed by the flat, but then just as suddenly light flooded the stage and revealed a large table and gigantic birthday cake, which had been concealed behind the flat. Good one, Powell! Back to the film! Kay notices that Larry’s relentless pursuit has slackened. He seems conflicted, and she thinks she knows why. Something bad is going down, and he has decided to be noble and give her up. But she wants Larry, and nothing is going to stop her. Larry wants Kay, too, but if he goes through with the con, it means skipping town and never seeing Kay again. He makes the monumental realization that he would rather have her than the money from the swindle. So he decides to end the con and try to make a legitimate and legal life in Habersville with Kay. But Duke isn’t going to like Larry’s change of heart! They were this close to making a huge amount of money. Larry bravely goes to Duke’s hotel room to give him the bad news. Meanwhile, Kay overhears Doc talking to Larry on the phone about stopping the scam. Doc is no match for Kay. She gets the whole story out of him easily. They both rush to the hotel to save Larry from Duke’s potentially violent reaction. And it’s a good thing they did, because Duke is furious. Duke slugs Larry and knocks him unconscious before turning to Kay. He’s not a nice man. The fight comes to an abrupt halt when Larry wakes up. Something is off. 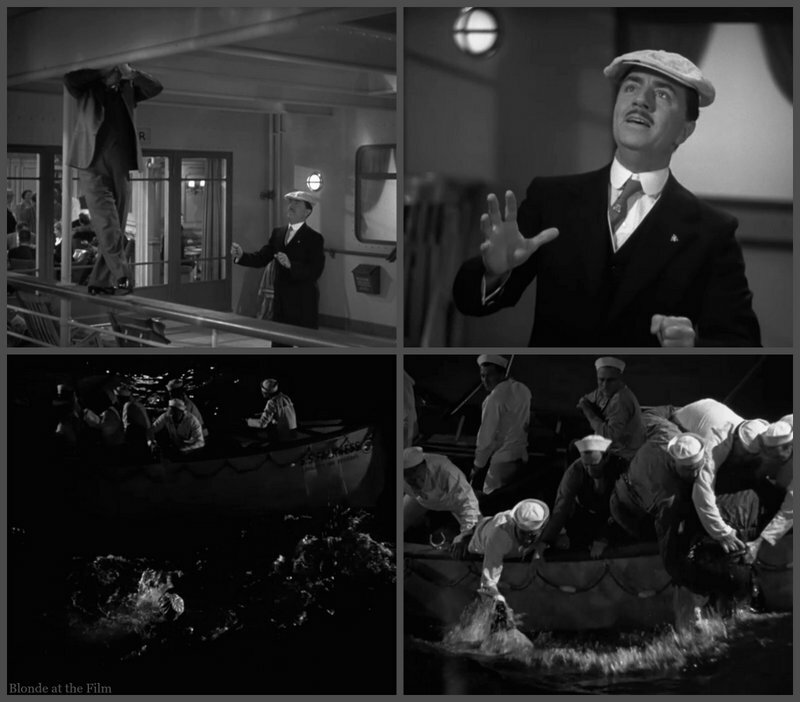 He talks like Old Larry, and thinks he is on the ocean liner and has just been rescued from falling overboard. He has no memory of anything after his dunk in the sea! It seems that this knock on the head has brought Old Larry back and sent George away, again. Kay is heartbroken. Doc is bummed, too, because he has just lost a pal. And Duke is still angry, but he knows that they definitely can’t go through with the con, now. While the men worry about the oil swindle, Kay sits in the corner and cries. She’s lost Larry yet again! Doc and Duke decide the game is up, and there is no use hanging around. They leave a very confused Larry and a distraught Kay alone. Then Kay gets an idea. Each head injury seems to switch Larry’s personality, so she grabs a vase and is about to whack him on the head in the hopes of bringing New Larry back. But then Larry drops his bewildered expression, draws Kay to him, and coos like a lovebird. Clever, clever man! He was only faking this bout of amnesia in order to get out of the oil scam! All is well in Habersville! This movie was very popular with audiences, so MGM immediately went to work on a similar film for this fantastic screen duo. 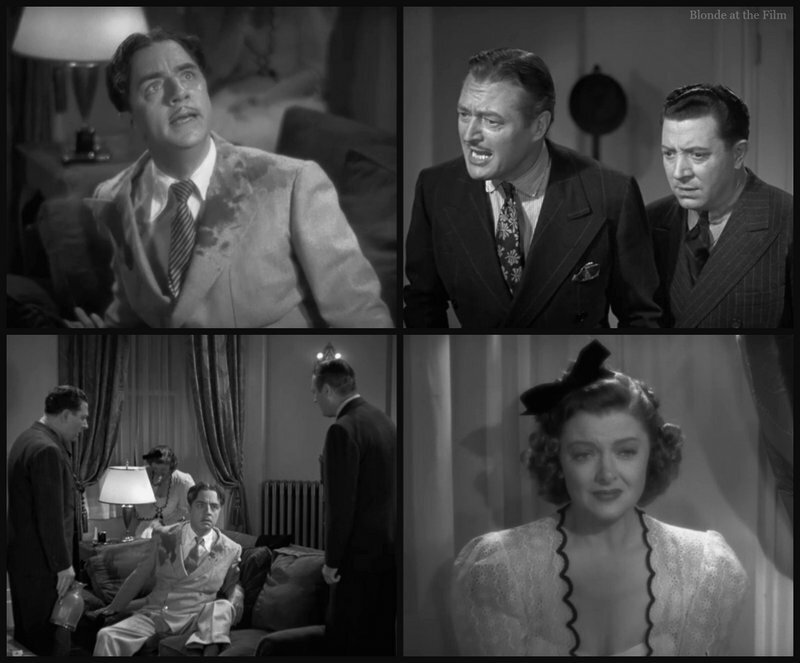 Love Crazy (1941) also features Loy as an unhappy wife trying to get a divorce from Powell. He is desperate to keep her, though, so pretends to be insane in order to delay the divorce proceedings. It sounds funny, but the gag wears pretty thin after a while. Plus, the whole plot is based on a series of simple misunderstandings, so after a while you just wish everyone would sit down and talk to each other for two minutes. I Love You Again sustains its silly plot much better, in my opinion. 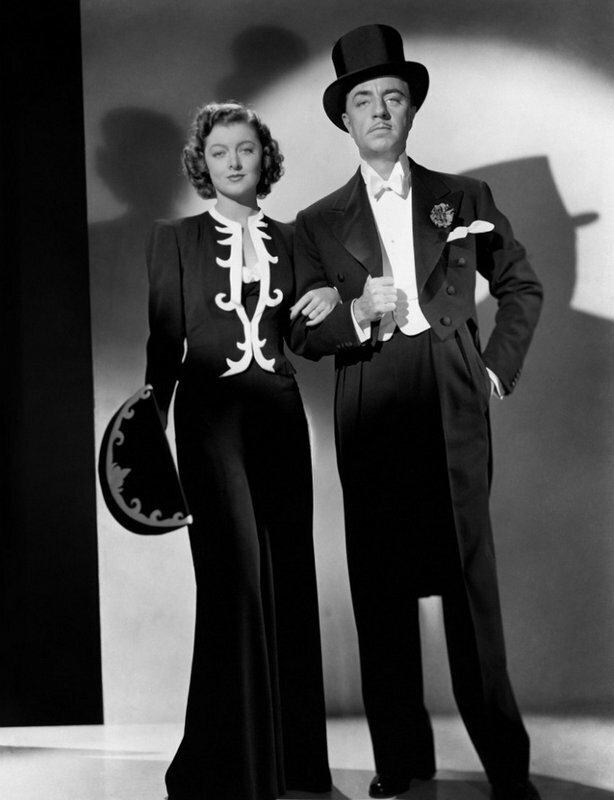 After Love Crazy, Loy and Powell would make four more films together, including three Thin Man movies and The Senator Was Indiscreet (1947), in which Loy makes a cameo appearance. Here’s the trailer–enjoy! For more, follow me on Twitter, tumblr, pinterest, Instagram, and Facebook! As always, thanks for reading, and you can buy this film here. Final costume appreciation break. 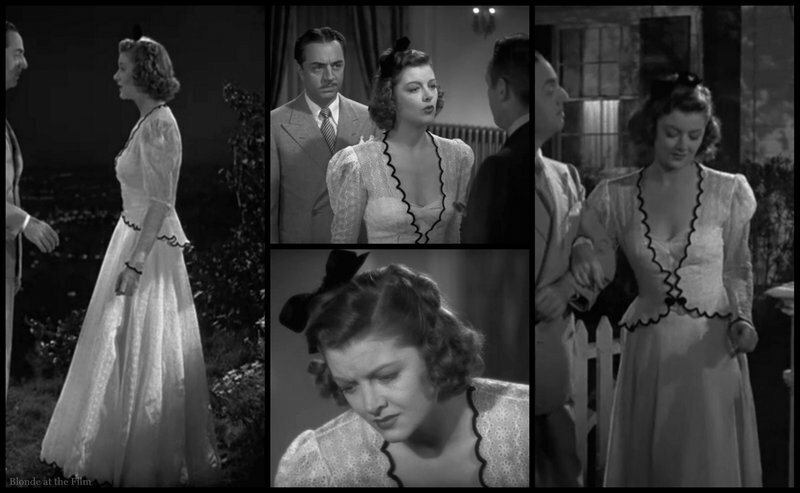 Loy’s eyelet dress is cute and innocent, which makes her near-slugging of Larry even funnier. Ahhh, I love this film so much. It ranks right up there with The Thin Man for me, which is saying a lot. When I first saw it, I was surprised at well the plot worked and how clever it was–as you mentioned, Larry/George is so quick-thinking and despite some very minor discrepancies (like Kay and Herbert’s reaction to seeing him in his Scout uniform), the script actually makes sense. 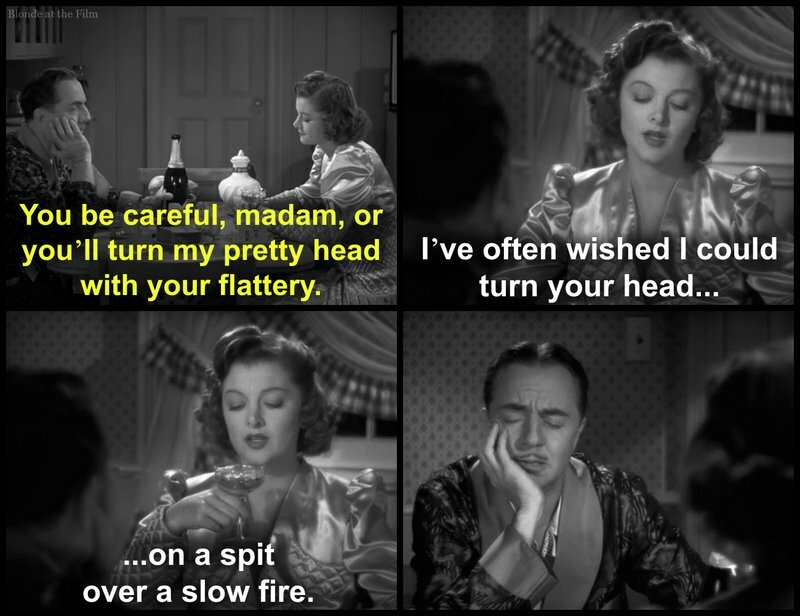 Well, in the only way a screwball comedy can make sense, that is. Great post! You always pick the best movies! Thank you so much, Michaela! It’s nice to hear from someone else who loves this movie! 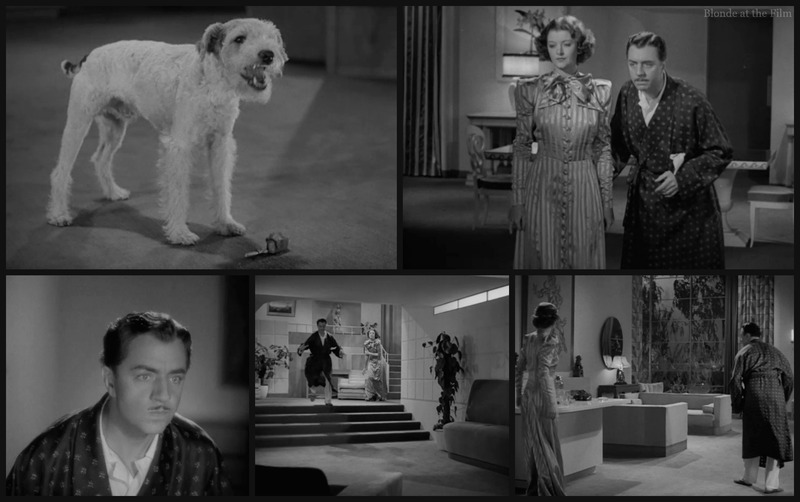 It often gets overlooked compared to The Thin Man series! Thanks for reading, as always! Just recently saw this film. I love it. 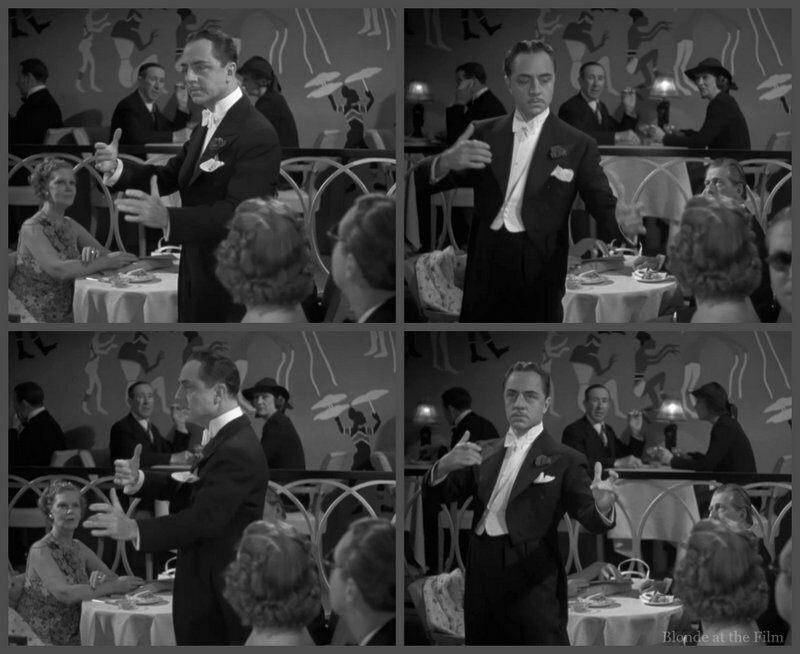 William Powell dancing by himself is hilarious. 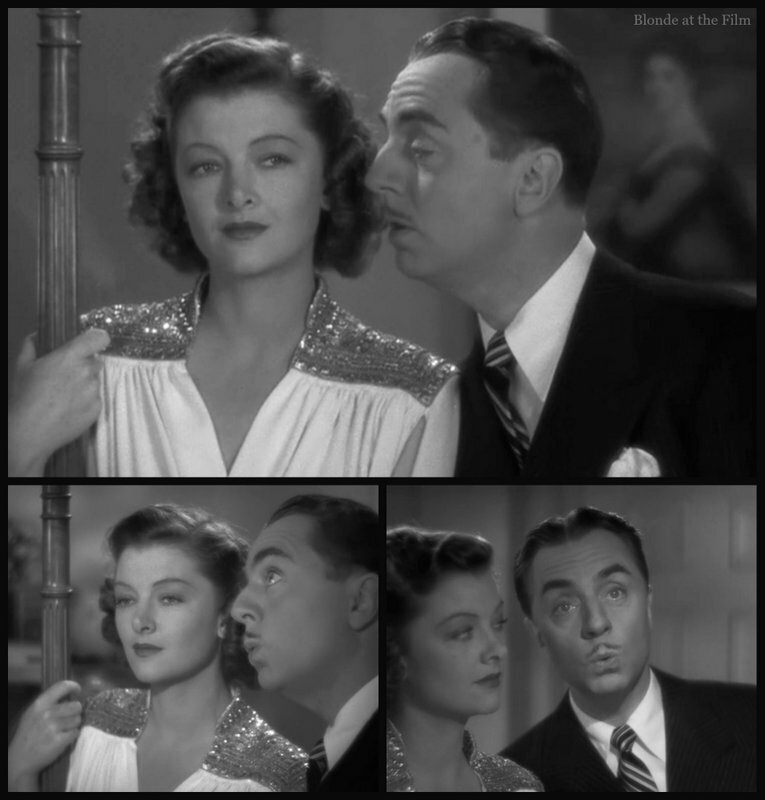 He and Myrna Loy are so unbelievably good together. You just know they genuinely care for one another. They are so natural. 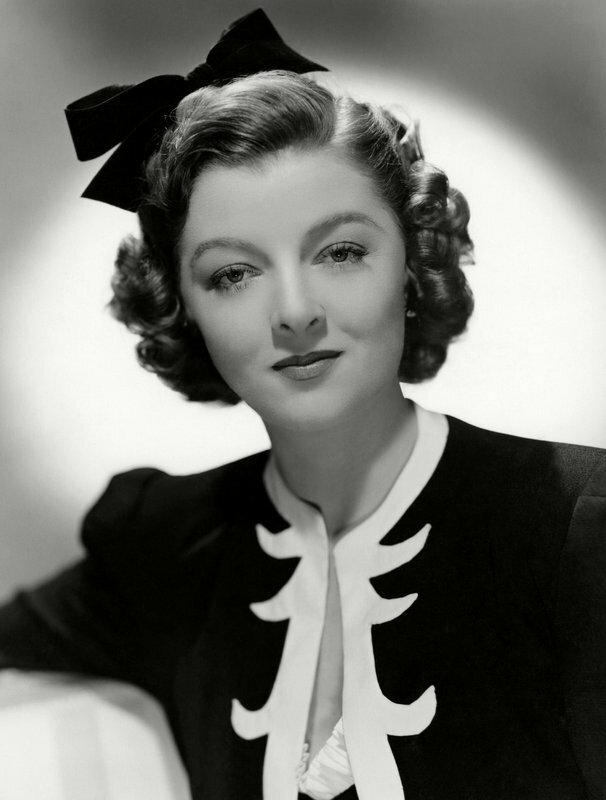 Such a good post and a good behind the scene story of Myrna’s birthday surprise. Nice to see something current on these two. Glad people still care for them. For as good as they are, they don’t seem to be as well remembered as others from that era. Too bad. Also, just watched High Pressure. Frank McHugh was a good pal in that one too.